Compost to gladden the hearts of a worm - earthworms have 5 pairs of hearts and really like compost. Here is a straightforward guide to making compost in your garden. Garden compost is wonderful stuff and a joy to behold, it improves the texture of just about any soil it is added to. If you're a plant, compost added to your soil is like a nice clean flannelette sheet and duvet cover on your bed just as it's getting cold in winter, It's like having ice, lemon and a cherry in your gin and tonic instead of it being served on its own and warm, it's like finding that there's butter and a choice of jams and marmalade after a week of dry toast for breakfast. There is no secret art to making good garden compost. Just as long as you stick to a few basic principles, you can easily avoid the nasty, stinky, sticky mess that can result if it's done wrong. 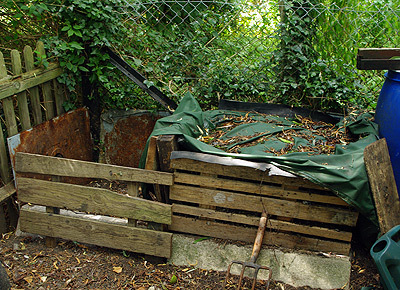 A compost heap is a large culture of bacteria and fungi feeding on dead plant matter. The trick is to keep these microbes as happy and plentiful as possible. 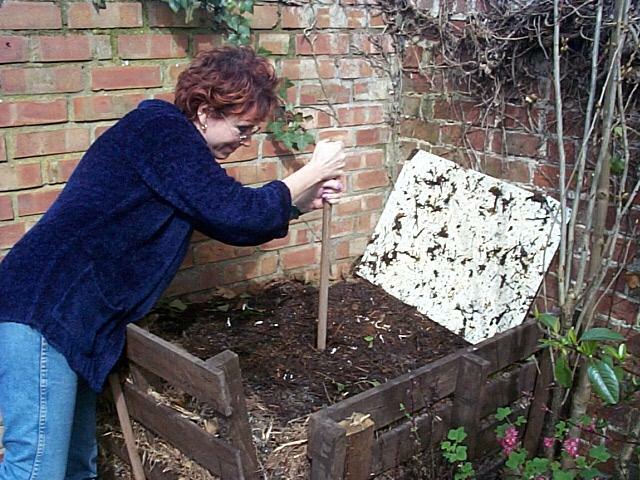 The bacteria and fungi break down the plant material on your compost heap. In order to obtain nice, dark brown, crumbly compost you need to keep happy a varied community of bacteria and fungi. Horrible slimy, smelly stuff that takes forever to break down is a result of too much of the wrong kinds of decomposer caused partly by providing poor conditions for them to grow in. Note - Garden compost will almost certainly NOT be like the soft crumbly stuff you get in bags from the garden centre, it is made as a soil conditioner for out in the garden rather than to use in containers. What is needed for your compost heap to rot down well and why? Correct Carbon : Nitrogen ratio. Matter added to the heap should be in small pieces. We all know that we need a balanced diet to be healthy, so it shouldn't come as too much of a surprise to hear that the same is true for other organisms, even bacteria and fungi. These decomposers in your compost heap need a balanced diet of carbon rich (brown material) and nitrogen rich (green material). Too much brown and decomposition grinds pretty much to a halt. Too much green (like piles of grass clippings) and it turns into a slimy mess. You don't need to measure it out just be aware of it, by mass 30:1 brown to green is needed, in reality it means that there should be some visible green amongst the brown and it should be well mixed up. I have a couple of big plastic tubs next to my compost heaps, if I have too much brown (autumn leaves for example) or green (grass clippings) I put them in the buckets temporarily and then mix them into the heaps when I next have the missing element to hand. The carbon-rich material (brown) will comprise most of the bulk of the finished compost, while the nitrogen-rich material (green) will get it all rotting actively and add valuable nutrients. reducing the size of your material before adding it to the compost heap is probably the best single step you can take to make your heap rot down quicker. It doesn't need to be shredded, though is better if you can do this or at least cut or break it up in some way to help the decomposers get into the plant matter and speed things up. Cutting trimmings up into smaller pieces with secateurs when pruning for instance. If I can't shred things, then I aim for no bigger than 4-6" though this increases when I'm tired or have lots to do. Leaves and other plant material is designed not to rot when a part of the plant. Just like our own skin protects us from infection, plants have similar protection. When we compost plant material we need to break up the surface to expose the soft inner parts. Smaller pieces also rot quicker and you don't get long stringy woody bits in the final compost mixture if it's broken up first. The raw materials of the compost also need to be mixed up so that the decomposers (which are only little and can't travel far on their own) regularly come into contact with fresh food, turning the heap helps a lot too. All life requires water to be active, the compost heap is very much a place of life. Thoroughly saturate your compost heap when it is made with a few watering cans or buckets of water and keep it covered to retain the moisture after this. If you add a lot of fresh shredded material at one time, it is surprising how much water it will soak up. Give it a thorough watering until it begins to trickle (not flood!) out of the sides and bottom. Once made and left to rot, your heap should have a cover to stop rain from getting in and to stop it drying out. The decomposing microbes grow better when oxygen is plentiful - aerobic conditions. Horrible smells and slimy messes result from oxygen deficient - anaerobic - conditions, if you've ever put lawn clippings into a bin liner and closed it up you will recognise this description of what happens. Anaerobic conditions also favour a different set of microbes that you want to avoid, the aerobic microbes are far better at making good compost. You can help oxygen reach the contents of the compost heap by having slatted or drilled (big holes) sides for air flow. Once the heap has got going (1-2 weeks) push a broom handle into the heap, right down to the bottom, I do this in the pattern of the dots on the 5 side of a die, wiggle it around to create a sort of chimney. You should get steam coming out of these vents which will help air and oxygen circulate into and through the heap. As the warm air rises up the chimney, it will be replaced by cold air being drawn in the sides over the material of the heap, so supplying it with oxygen. 5 - Add decomposing microbes to begin the "culture"
Like making that other useful microbial culture, yogurt, you need to add a good starting culture. Fortunately soil is already full of the right sorts of microbes in small quantities or as dormant spores. Adding some soil or mature compost every now and then will start your compost off nicely, this can be from discarded compost in containers or soil attached to the roots of plants that you are composting. I've never found it necessary to add anywhere near the 15cm (6") layer of soil as sometimes suggested, it also saves the problem of finding so much soil to add to your compost heap regularly. A good well-made heap will generate lots of heat, starting 1-2 days after it has been made and lasting for around two weeks to a month or more depending on the time of year. An insulated lid (in particular) and sides if possible will help to keep this heat in and speed up the decomposition of the compost. An old carpet is ideal for this, particularly if foam backed from the bathroom so it's water proof, fold it over a couple of times to add to the insulation value. It is better if you can make a large heap of compost in one go. Plan to do lots of pruning and weeding at the same time, I always coincide hedge trimming with lawn mowing for instance and leave the lawn a little longer than normal so I can mix the clippings from both activities. Shred the material that you add to the heap if you can or at least reduce the size, this is one of the best things you can do make quality compost. Make sure you mix brown and green material together, the exact proportions are can vary quite a bit, just make sure that there's always some of each and always more brown than green. Put some kind of lid on the compost heap to keep the rain off and for insulation. Even if you make the compost in a proprietary bin with its own lid, cover the top of the compost (inside the bin) with a piece of old carpet, bubble wrap, polystyrene or similar to help with insulation. Water very well initially and keep moisture in afterwards, but protect from rain. Push a broom handle into the heap after a couple of weeks when it has settled to open it up to the air. Turn the heap over once made, say after 1, 6 and 12 months, though it depends on having space to do so. To make compost in the best possible way you really need at least two identically sized heaps, one next to the other. One that you are adding to and one that is rotting down gently after the initial heating phase is over. I have two such longer term heaps and a separate plastic compost bin where material goes to start with, it decreases in size very quickly in the first month or so. Forget about small doors to let the compost out, you need to be able to lift the bin entirely off the heap or remove a side completely for proper access with a full sized garden fork. I finally got around to trying something I've been meaning to for ages, mixing grass clippings with shredded newspaper to make compost. This is an often repeated suggestion and I saw it on a gardening programme on the TV so it reminded me. The presenter had a nice clean tub of clippings and another of newspaper soaking in water, he took a few newspapers sheets and ripped them before dropping them onto the clippings, it took about 30 seconds and looked so easy. Most of the time my garden produces a fairly good balance of brown and green material for the compost heaps. Grass clippings are especially useful as when they are mixed with other less easily compostable matter, their heat and nitrogen gets it all going nicely. It's not common for me to have an excess of grass clippings to try this, but eventually I did. I went down the garden with a few newspapers and a bucket of water. The newspapers went into the bucket to be soaked and I started to pull them out. Well - guess what happens to wet paper? it all sticks together, so getting one or two sheets thickness is really difficult, then you rip it and add it to the grass clippings. Now of course, your hands are wet and the clippings stick to your wet hands and get everywhere. After 10 minutes, I'd dealt with about a single newspaper and was rapidly advancing to a state of high dudgeon. Conclusion - if you have the patience of a saint and all the time in the world, this method probably works. For normal mortals however, it's easier to add the grass as it comes and then mix it later using a fork when some non-grassy material arrives. The problem with newspapers is that they need to be added no more than one layer in thickness (of paper, i.e. a page - not a whole paper) if they are to rot quickly (less than a year) and that's a real pain to do in quantity. If there are several layers of paper, they manage to resist rotting far better than just about everything else. I suggest you don't bother and join me in pooh-poohing any further suggestions of doing this by people who quite clearly have never really tried it. Warning - Making garden compost can become addictive. In extreme cases, it is possible to see the garden as a being an elaborate means of keeping the compost heaps going. Q. My heap doesn't seem to get hot at all like it's supposed to. A. The usual reason is that there's not enough material added at one go. There needs to be a reasonable amount of fresh material added to get the temperature rising. Not enough nitrogen - too much brown material, not enough green. The heap is too dry. The material is in too large pieces and needs cutting up. Q. I've heard that urinating on a compost heap helps, is this true, or is it a joke? A. Urine contains nitrogen that will help feed the microbes and speed up their break-down of the brown carbon-rich material. Also, the water content will help keep the heap moist. I regularly pee on my compost heap - but only when no-ones looking. Q. I thought that it was worms that broke down the organic material into compost, what's all this about microbes? A. 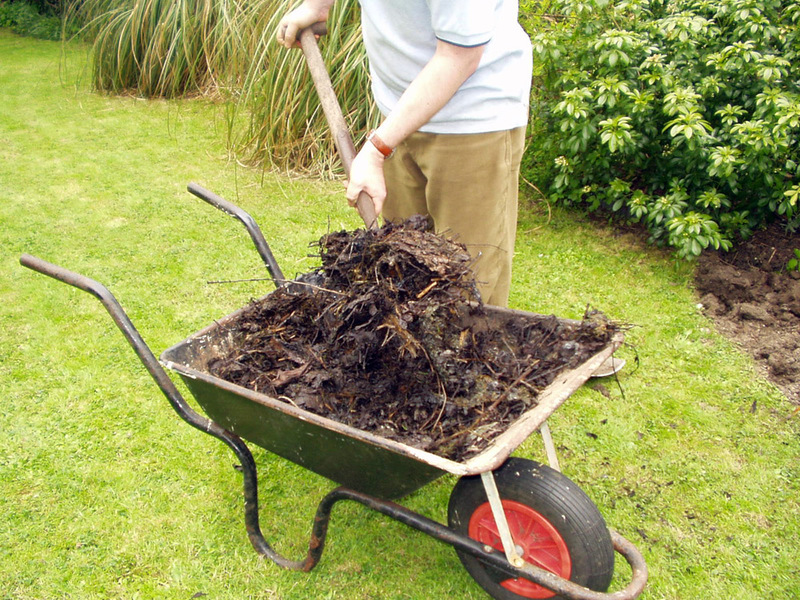 Initially when a compost heap begins to rot, it is microbes, bacteria and fungi that feed on it and break it down. This generates large amounts of heat, to the point where only microbes could even survive, larger decomposers such as worms would quite literally be cooked. Later on after a few months, when the heating stage has subsided, larger decomposers such as earthworms, woodlice, and more familiar fungi that produce mushrooms of various kinds will begin to decompose the heap. It is during this stage that the matter in the heap becomes further processed, becomes less recognisable and becomes darker and more crumbly. Q. What is better a traditional compost heap or a new style plastic compost bin? If you don't have much space or produce much compost material, then a bin is probably better. They are good at dealing with small amounts of material, retain some heat and keep the rain out. They do become full very quickly however if you have a lot of material to compost. I use one for the initial hot-phase of compost making and would recommend them highly for this. Put new material in the bin and then let it rot down, and keep adding to the bin until full. Leave for another month after it' s full (if you can) and then turn upside down onto a more traditional heap, leaving for a further 6 to 8 months before using, and start again in the bin. You should be able to fill the bin with about 3 times its volume over a period of time which would then decrease to 1 times its volume before moving the semi-rotted material to the heap. Q. More than anything else, my garden produces grass clippings, but these make the compost sticky and smelly, what is the answer? A. This is a common problem. 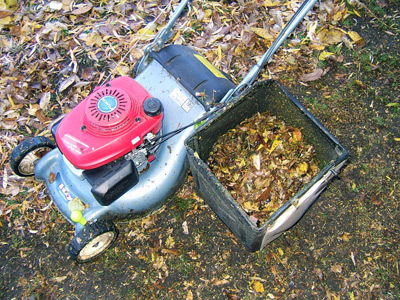 Grass clippings can help make very good compost but not on their own. Mix them if at all possible with other woody (brown) material. You could mix them autumn leaves if you have a pile of these somewhere rotting away slowly, this will be beneficial for both. You may see recommendations to use an equal volume of newspaper torn up into strips, mixed in then wetted, I tried this once and had a very frustrating and messy couple of hours, I won't be trying it again and don't recommend anyone else does. The worst thing you can do with grass clippings is what people often do and put them in a black bin liner that is then tied tight so that no oxygen can enter, making the whole smelly horrible mess all the more unpleasant. Alternatively, do you really need to always collect the clippings? In the summer when the grass is dry and fairly short, you could leave them on the lawn to dry out before collecting, or even buy a "mulching lawn mower". Q. What is the best thing to with all the piles of autumn leaves that I sweep up from my garden. A. One approach is to put them in a post and wire mesh container and let them rot down alone to make leaf mould which is an excellent conditioner, though takes at least a year before it's ready and realistically will be in the spring of the second year after the leaves are swept up in the first place. This requires a fair amount of space for long-term storage. You could save them until the following spring / summer and mix them with rich green material such as grass clippings (above). One tip I heard, though have not tried is to half-fill a large tub with (preferably dry) leaves and then cut them up using a strimmer. This would help to break them down more quickly whatever you then did with them subsequently. Q. I have collected a lot of leaves from the Autumn fall in my garden and have stored them with the intention of digging them in to the soil in the veg patch. Will the introduction of a lot of leaf compost over a long period (i.e. every year) alter the balance of the soil? A. The short answer to your question is - yes. As the leaves rot down they will tend to become acidic, this will reduce with time and as the leaves continue to rot, they will become less acidic. If you dig them into your veg patch every year, I would expect it to reach a certain level of acidity and then not get any greater, as you add more leaf mould, so another lot will rot and the acidity of that bit will reduce. The overall effect won't be great however. If you have lots of leaves every year, it would be a real waste of valuable organic material not to use them. What I would do is add some lime to the heap when you gather them up in the autumn. This will help the pH of the leaf mould and also help the microbes to break the leaves down, they operate best in slightly alkaline conditions. The lime will also help your compost heap when the leaves are dug in as most vegetables prefer alkaline to acidic conditions. Q. We have a bin full of home made compost, can we use this in pots for patio plants? A. Not really, garden compost is usually quite rough in texture due to the way it is made over a long time period, it's great as a mulch or for digging into planting holes elsewhere in the garden. As a bag of potting compost is a lot cheaper than the container plants you'll put in it, don't even risk it.